During the elementary school years, the child becomes increasingly interested in peers, but this should not be taken as a sign of disinterest in the parent-child relationship. The parent-child relationship continues to remain the most important influence on the child`s development. Generally speaking, children whose parents are both responsive and demanding continue to thrive psychologically and socially during the middle childhood years. The parenting styles that first become apparent during the preschool years continue to influence development across middle childhood. Children of authoritative parents tend to be socially competent, responsible, successful in school, and high in self-esteem. Children of permissive parents also tend to be more aggressive than their peers, but also more impulsive, less self-reliant, and less responsible. Children raised in disengaged homes continue to have the most difficulty, and show more behaviour problems. The natural tendency is to think of the parent-child relationship as a one-way street, with the parent influencing the child. But in actuality the relationship is reciprocal. During the school years especially, the parent-child relationship is influenced not only by the child`s parents but also by the child. 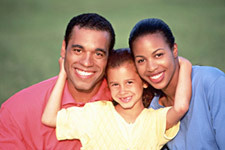 In most families, patterns of interaction between parent and child are well established by the elementary school years. Overly harsh parenting, for example, often leads to aggressive behavior in children, leading children to join antisocial peer groups, further heightening their aggressiveness. This, in turn, may provoke harsher parenting, leading to further aggressiveness in the child, and so on.